Every 2nd Sun : ??? 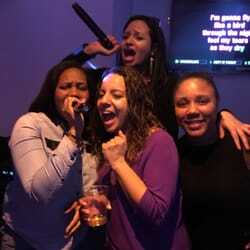 Experience the Unique Karaoke in Sydney South Uptown Funk Vibe! Karaoke in Sydney South has plenty of regulars that part-take in singing as often as possible – it’s YOUR turn! Seriously the fab karaoke pubs, bars and clubs in Sydney’s South have their own unique Southern Uptown Funk vibe going on! Come on down and get some! St Georges Tavern, Rockdale has some serious karaoke attitude every Thursday night. Although not too flashy, the Kings Head Tavern is undoubtedly what you’d expect a Sydney South pub to be like – it ticks all of the boxes! Comfortable, pool tables, awesome bistro, beer garden, pokies and of course regular first class Saturday night karaoke! Fortnightly gigs also occur in Rockdale and Mortdale, so there’s plenty of karaoke in Sydney Southern suburbs.We've also included the East Sydney karaoke gigs on the map so you can check them out as well.